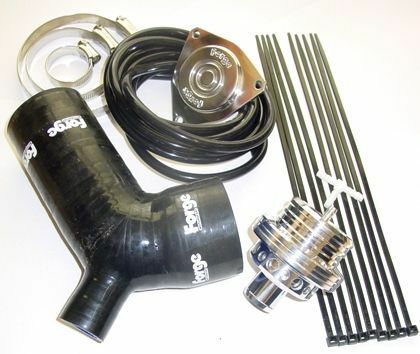 Dump / Blow Off Valve complete with Fitting Kit. Dual-Piston Atmospheric Valves and Valve Fitting Kits. All Forge Motorsport Dual-Piston Atmospheric Valves have been designed and built with the intent of venting 100% of the residual charge air remaining in your forced induction system to the atmosphere at throttle lift. While we have incorporated many elements into the design of the Dual-Piston valves to aid in their compatibility with mass air-flow sensor equipped vehicles, we cannot always guarantee that each individual’s application will be compatible with a valve that vents the charge air into the atmosphere.